In 1995 Tom Hunter and his friend Sam refitted a near-scrap double decker bus with sound system and kitchen, creating Le Crowbar Café. In this bus Hunter served food throughout Europe in the mid 1990s, part of a moveable techno feast that was the expression of a communal ethos and the focus of a nomadic lifestyle. Hunter’s photobook Le Crowbar describes this adventure, from a distance of nearly twenty years. The Criminal Justice and Public Order Act 1994 defined what would be considered, in the UK, anti-social behavior. The Act specifically criminalized raves, described in the Act as gatherings of 100 or more persons where amplified music “characterized by the emission of a succession of repetitive beats” is played. When the Act stifled the techno/rave movement in the UK, leading to its eventual commercialization, Hunter and Le Crowbar took to the road, wandering through France, Spain, Austria, and the Czech Republic, where they sought like-minded travelers. Many of Hunter’s photographs in Le Crowbar are scenes of rest and of everyday life at festivals. Sunlight plays over resting, retiring bodies, young people and children in and around festival encampments. Many of the pictures are subdued, evoking the feeling of lazy late afternoons. The music is unheard and dancing has been all but omitted. Only four of the photographs in the book were made after dark; perhaps this is a function of Hunter’s stylistic preferences- natural light imbues the pictures with a gentle softness- but it is also the story that he has chosen to tell, not only of dancing crowds or all night parties, but of daytime recovery and repose, gatherings without urgency. Only occasionally are we shown the scale of the assemblies of people, or made aware that these gatherings are anchored by mass events. People read books, sleep in the day, set things up and take them down; they walk across fields and sun themselves by a pond. Meals are prepared and shared. Sometimes the travelers intersect visibly with the communities through which they pass. We see a stop at a restaurant and a visit by a police officer. Le Crowbar’s red and white stripes contrast against a grey concrete apartment complex. Hunter’s pictures, intimate and still, are notable in that they address the specificity of the moment without making any greater claims. That is, despite the edenic setting, the subjects of the pictures are not asked to stand for anything other or more than themselves. They do not evoke metaphors; they are not held up as symbols, they are not idealized (although Hunter's pictures do resonate with traditions of pastoralism in Western art.) Hunter is very good at making pictures that are easy to look at for a long time, without hanging their weight on external references. The pictures appear to describe without affect. But of course that’s not really the case; it’s the poise in Hunter’s regard that gives them the feeling of naturalness that makes me respond with, “of course, that’s exactly what that must have been like”. Hunter is an insider, a participant in this milieu and so we see what he is interested in. There is nothing exotic here, a subject that an outsider might be drawn to, nothing spectacular. Instead what he shows us is a great deal of detail, and a pervasive calm. The pictures are ethnographic in their attention to the way in which the subjects experience their world (and they are ethnographic in a way that photography claiming the term rarely is). Yet, although individual pictures do not have a romanticizing cast, the overall narrative of the book does convey a feeling of longing. This is, after all, the story that Hunter chooses to tell about his own past, two decades later. What begins as a small group of friends on a quest gathers momentum and increases in mass through the course of the book. The light gets harder and the sun gets hotter. The journey ends at a Mediterranean beach; we see that Le Crowbar has joined a ragtag fleet of similarly reinvigorated vehicles. So, if these are Hunter’s memories, his story retold by his older self, what do we make of this reminiscence, especially if we were not in this scene in the 1990s? In his preface, Hunter writes of the 1992 Castlemorton Festival as a “pivotal moment in the history of fashion, music and society”. These pictures describe not that moment, but Hunter’s response to it, and this may be the extended value of Le Crowbar. At a moment when our lives are shaped by commercial technologies that urge us to look forwards and not back; when nostalgia is packaged into icons that signify coarsely in shorthand; when we can connect with nearly anyone, but not according to protocols of our own choosing; Le Crowbar describes another path, taken by choice, to wander and to seek direct connection. 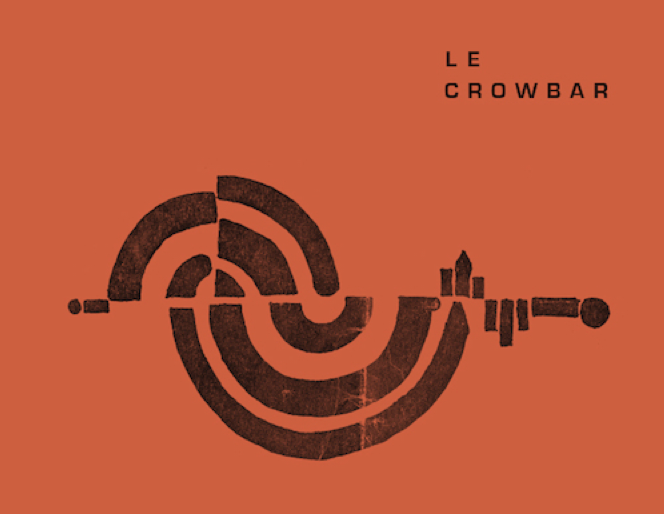 What Hunter celebrates in this book are not the music festivals, but the recognition that Le Crowbar’s journey was, for a moment, a way of life, and that there is always another way.